First, we have built an open-source, interactive, data-rich map of the city of Aleppo, at the neighborhood scale. Users can navigate the city, with the aid of high resolution satellite imagery from before and during the current civil war, and explore geo-located data about cultural sites and urban damage. We will add data as it becomes available; currently we are grateful for datasets from from Human Rights Watch, the United Nations Operational Satellite Applications Programme (UNOSAT), and the Humanitarian Information Unit (HIU) at the U.S. Department of State. Second, the map is a platform into which additional data of all sorts can be integrated. It is an invitation to students and invited collaborators to record and narrate urban damage in Aleppo — at the cultural, infrastructural, or neighborhood scale — and to present that research in case studies which will be added to the website over time. We invite ideas and propositions, and hope to build on the data that we have compiled here to develop further research on and engagement with the situation in Aleppo. It is a call for inquiry and a call to action. Since 2012, the people of Aleppo — one of the oldest continuously-inhabited cities in the world — have been exposed to catastrophic violence. Many thousands have been injured, died, or fled. Our project focuses on their city and what has been done to it and what might happen to it in the future. 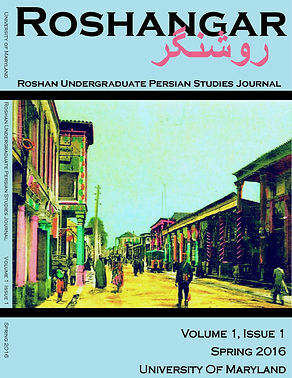 "The Roshangar Editorial Board is proud to announce the first issue of Roshangar: Roshan Undergraduate Persian Studies Journal. Click the above photo to download the first issue of the journal, free of charge. The journal features interdisciplinary student research in the numerous field including Persian studies, history, gender studies, and film studies. Please read and enjoy the articles, and continue following our publications in the future!" The Digital Averroes Research Environment (DARE) collects and edits the works of the Andalusian Philosopher Averroes or Abū l-Walīd Muḥammad Ibn Aḥmad Ibn Rušd, born in Cordoba in 1126, died in Marrakesh in 1198. DARE makes accessible online digital editions of Averroes's works, and images of all textual witnesses, including manuscripts, incunabula, and early prints. Averroes's writings and the scholarly literature are documented in a bibliographical database. At the same time, DARE is a research platform, giving scholars who work on Averroes the opportunity to present their research and to discuss questions related to Averroes's thought in the Forum. A collaborative, evolving, and open-ended project hosted by DARE is the Averroes Encyclopaedia, designed to document Averroes's philosophical, scientific and technical vocabulary. Launched by the Thomas-Institut in February 2010, DARE will continue to evolve during the next years before reaching the complete documentation and digitization of Averroes's works that is intended. DARE is funded by DFG. See also: Hakkı Tarık Us Collection - digital archive of Ottoman periodicals. Digitized by Staatsbibliothek zu Berlin in ZEFYS : Zeitungsinformationssystem. Türkische Post : Tageszeitung für den Nahen Osten. Published: al-Qāhirah : Muṣṭafá Kāmil, 1889-1915. Digital copies: July 1, 1896 - Dec. 31, 1898. Aligned corpus of Divan-e-Hafez, translated by H. Wilberforce Clarke. Calcutta, India. 1891. Read this page in Persian. Classical Persian is universally recognized as one of the world’s great classical languages, but outside of Iran it has not received the attention given Greek and Latin or even classical Arabic, despite the survival of an immensely rich literature and a tradition of scholarship that is still alive today. European scholarship first became aware of the importance of Classical Persian in the late eighteenth century with the work of pioneering philologists like Sir William Jones, who translated a number of poems into English, but it was not until the publication of Goethe’s magnificent tribute to Hafez in the West-östlicher Divan of 1819 that the importance of this tradition came to the attention of a wider public. Persian poetry, including that of Hafez, Rumi, Saadi, and many others, has continued to fascinate readers and scholars around the world, making the work of Hafez an especially attractive topic to begin the Leipzig Open Philology Project’s work with Persian- one that can engage both scholars and the wider public, both in Iran and internationally. As a first step, we are assembling a wide variety of translations of Hafez into many different languages, and providing a website where participants can play a game of aligning the words and phrases of the original text with the corresponding words in the translation, saving their work in a form that vividly displays the links when you mouse over the text. We believe that this game encourages close reading of the text while also exposing the limitations and compromises that translation necessarily entails. Readers– who are reading or studying the poems Learners– who are studying the language itself Contributors– who wish to enhance the reading and learning resources that will be freely available to others in the future. If you identify with one of these groups, or just want to see whether you enjoy the alignment game, please feel free to try it out. We welcome your participation. We will have some webinars to instruct interested participants to let them go forward step by step in the Perseids treebanking environment and our alpheios alignment environment. Regardless of language you speak, join us and be a part of Open Persian Society. Here you can find the aligned corpus of Divan-e-Hafez, translated by H. Wilberforce Clarke. Calcutta, India. 1891. "The Center for Middle Eastern Studies at the University of Arizona has assembled an impressive array of lesson plans and educational materials on topics related to the geographies and cultures of the Middle East. Organized in alphabetical order, here educators will find such fascinating guides as "100 Years in Mesopotamia: A Century of Conflict in Iraq, 1914-2014," "Afghanistan Through Youth Literature," and "All Roads Lead to Istanbul: 1550 World's Fair Simulation," among many others. The lesson plans are distinctive for their erudition and their appropriately complex treatment of historical and cultural subjects. Many of them feature PowerPoint presentations, primary sources, or other instructional guides to help lead high school and college students through the lessons"
Labels: Islam -- Study and teaching., Middle East -- Study and teaching. Archaeology/ Arkeoloji, Art History/ Sanat tarihi, History of Architecture/ Mimarlık Tarihi, Restoration-Conservation/ Restorasyon-Konservasyon. Art-Sanat is an international academic refereed e-journal. The Bodleian Libraries’ important 12th-century copy of ʿAbd al-Raḥmān al-Ṣūfī’s Book of Fixed Stars, an illustrated Arabic treatise on the Constellations is now available online via Digital Bodleian and Fihrist. "The British Library’s oldest Qur’ān manuscript, Or.2165, dating from the eighth century, has now been fully digitised and is available on the British Library's Digitised Manuscripts site. Among the most ancient copies of the Qurʼān, it comprises 121 folios containing over two-thirds of the complete text and is one of the largest of known fragments of an early Qurʼān written in the māʼil script."